Care: Dishwasher Safe. Microwave Safe. 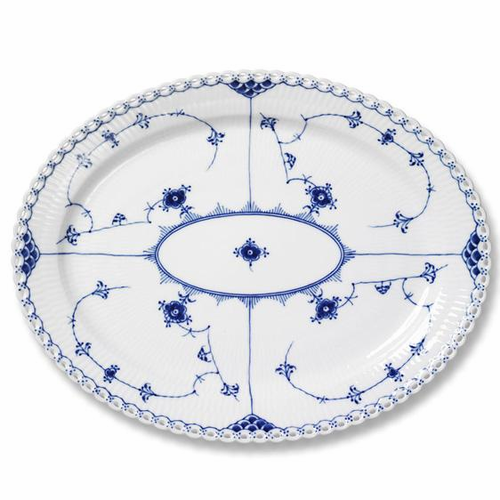 Historical yet timeless: Royal CopenhagenÆs very first porcelain dinner service, the Blue Fluted pattern is as graceful as when it was first adopted in 1775 as the very first porcelain dinner service. Its most intricate and exclusive design is the Blue Fluted Full Lace û astonishingly detailed craftsmanship goes into every single detail. Arnold Krog(1856-1931) was educated at the Royal Danish Academy of Fine Arts, School of Architecture, and went on to specialize in restoring castles in their original historical style. 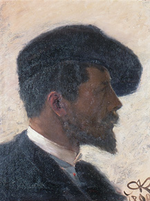 In 1885 he was appointed artistic director of the Royal Copenhagen Porcelain Manufactory. His first undertaking at the factory was to reconstruct and relaunch the ancient Blue Fluted pattern. In the course of this work he created the magnificent service that has been one of Royal Copenhagen's finest for more than a hundred years. "I was adamant in my demands..."
Even before the summer of 1885 Arnold Krog had made certain corrections to the reproduction of the pattern, which had become rather poor with the passing of the years, and he managed to revolutionize some of the designs. "And then I got to grips with it, and tried to create forms that were suitable for covering with the decoration that had been established for years. I was adamant in my demands in this respect, no matter what I was trying to design." Later on, in 1913, Arnold Krog developed the Blue Flower angular coffee service into a complete dinner service with the old Blue Flower pattern as the decoration. A Late Empire coffee service created by his predecessor, architect G.H. Hetsch, who was Artistic Head of the Royal Copenhagen Porcelain Manufactory from 1828-1864. Arnold Krog now set to work on the underglaze painting technique coupled with inspiration from the craftsmanship of East Asia - mainly works from Japan, quite a number of which arrived in Europe during this period - which led to the development of an entirely new painting style and technique, combining Japanese imagery with European naturalism. The selection of colors was limited at first to blue cobalt. But in the course of a few years the range expanded, facilitating the depiction of the Danish landscape in soft, misty tones. Vases and dishes, soon to be followed by naturalistic figures of animals and people were presented at the major exhibitions of the day - and were awarded distinctions! Arnold Krog's creative efforts within the underglaze technique established the international success of the Royal Copenhagen Porcelain Manufactory.